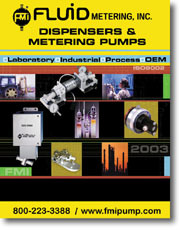 Fluid Metering Inc., of Syosset, N.Y., released its new, 30-page catalog covering dispensers and metering pumps for laboratory, industrial and OEM applications. Featured is the company’s new IDS2000 industrial dispenser designed for integration into 24/7 production applications. The catalog includes unique piston-type positive displacement units with no valves, low-dead volume, 1 percent accuracy and a ceramic/fluorocarbon fluid path. Flows ranging from 2.5 µl dispense to flows of 4,600 ml/min. with pressures up to 100 psig.